Love growing your own herbs and vegetables, but also love the hustle and bustle that living in a big city has to offer? Well, while the two don’t necessarily go hand-in-hand, just because you want one doesn’t mean you can’t have the other. There are 4 main things you’ll need to consider before starting your apartment garden. (1) the amount of space you have available, (2) what kind of light you will give your plants, (3) the temperature of your apartment, and (4) the level of humidity. An indoor garden can really be as big or as small as you want it to be. That just depends on how many plants you want to grow (and how much space you want to dedicate to your garden). People who want to have larger gardens or grow plants that require more space might want to consider specifically dedicating a table or bench to their garden — even a small room if you have it (which if you do, we as New Yorker’s envy you). Pro Tip: Shelves can provide you with a ton of room for plants without taking up any floor space. Put a simple shelf by a window, or even use a window sill. Light is slightly more tricky. Ideally, your apartment has a big enough window to provide ample light for your plants to grow, but this isn’t always the case in small apartments surrounded by big buildings, especially in the winter months. More than likely, you are going to need some additional artificial light. Plants can only absorb the same wavelengths of light that the sun gives off. Therefore, normal light bulbs won’t work. We’re not going to get into the science behind that, but just trust us. Incandescent Lamps are fairly inexpensive and can be bought at most hardware stores. They can work, but aren’t ideal. They get hot very quickly and aren’t very energy efficient. Fluorescent Lights are best for plants that don’t require a lot of light, like herbs (scroll down to see more about lighting requirements). They will not provide enough light for flowering or budding plants. You can also buy these at your local hardware store. Compact Fluorescent Systems, a newer version of fluorescent lights, are much brighter and more efficient than their older counterparts and can therefore be used for all plants. They produce less heat than the other options so they can be placed closest to the plants. These are probably your best bet if you want to light a garden with a variety of plants. HID (High Intensity Discharge) Bulbs are the brightest and most efficient lights available, but also the most expensive. They are the most complex lights to purchase as they come in several types with lots of different specifications. At Moved, we don’t really like complexity ;). **Check out this link for a guide on building your own grow light system. The ideal temperature for most plants is between 65°-75°F. Plants grown in temperatures that are too warm will be small and weak. Plants that are too cold may have dry, yellow leaves that fall off. Too little humidity can be challenging for indoor gardeners, especially in the winter months when the air is dryer. While humidity levels aren’t very easy to measure, three signs you have a humidity problem are if (1) the tips of the leaves are brown, (2) your plants look withered, or (3) the leaves are falling off your plants. Some options to increase the humidity levels of your indoor garden are positioning the plants closer together, setting the plant containers over a bed of moist pebbles or spraying them with a misting bottle. So what can you grow in your indoor garden? Well theoretically, when provided with the right amount of light, water, and space, anything CAN grow indoors. That being said, certain plants lend themselves to growing indoors more easily. We recommend you try some of these, especially if this is your first time. Once your gardening space and lights are in place, you’ve chosen your plants, and the conditions in your apartment are ideal for growing, you’re ready to plant! There’s 3 things you’ll need: growing containers, soil, and seeds. For most greens, you’ll need containers that are about 4 inches deep. For carrots, you’ll need at least 6 inches. You don’t necessarily have to go to the store and buy new planters. Consider using things like recycled produce containers or window boxes. Get creative! Whatever you use, you’ll want to put a plastic tray beneath the containers to prevent water from dripping. Different people will recommend different things, but in general, you should buy an organic, all-purpose potting mix for your indoor garden. You can buy seeds for the plants of your choosing at your local nursery or home improvement store. 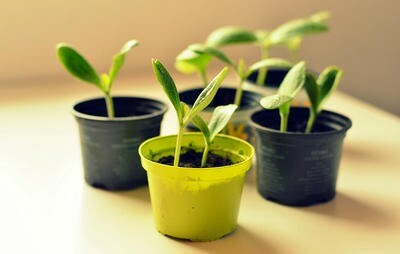 If you’re less patient, you also have the options of buying seedlings (plants that have already started to grow). Herbs grow especially slow so you might want to consider seedlings for a quick harvest. Fill the growing containers with soil and plant your seeds or seedlings, following the instructions on the back of the package for each individual plant. If using seeds, keep the soil evenly moist until the plants germinate. Hang the grow lights approximately 2 inches above the plants. As your plants grow, you’ll have to adjust the light. Plants grown under artificial light will need 12–16 hours of light each day. You can purchase a timer to make this easier. Water twice weekly, or when the surface of the soil feels dry. If the leaves of the plants show signs of stress, fertilize them with a weak solution of fish emulsion.